This wetlands datalayer has been superceded by a statewide update of the wetlands data based on photointerpretation of 2005 aerial photography. This datalayer is being maintained for reference purposes only. Please see the current MassDEP Wetlands (2005) dataset. 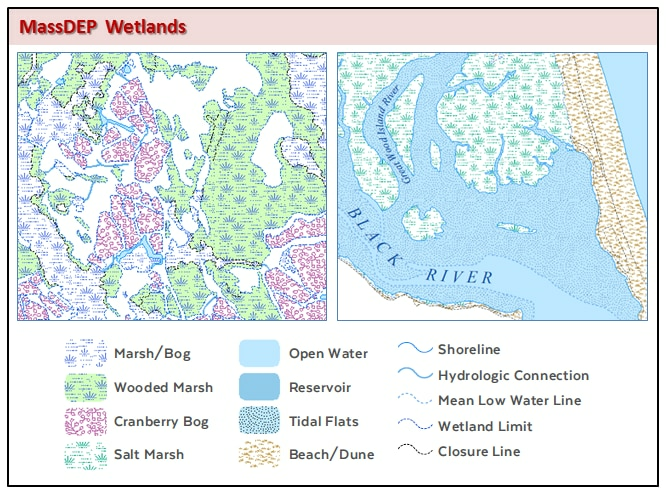 The WETLANDSDEP_POLY_ORIG layer contains polygon features delineating mapped wetland resource areas and attribute codes indicating wetland type. The WETLANDSDEP_ARC_ORIG layer was generated from the polygon features and contains arc attribute coding based on the adjacent polygons as well as arcs defined as hydrologic connections. These statewide layers enhance and replace the layers formerly known as 1:5,000 Wetlands and Streams. The features are seamless, no longer tiled by orthophoto quad index boundaries. Features are split along OQ tile boundaries only where attributes are different; this occurs in a small number of features. Distribution is statewide, not by OQ tile. Custom extracts may be downloaded through OLIVER (see links above). New fields have been added to the 2 attribute tables, including PALIS and PWSID information, and codes (POLY_CODE, ARC_CODE) for more generalized symbolization, similar to the codes in the 1:25,000 Hydrography layers. Area attributes (square feet and acres) are included for polygons. (See the "ATTRIBUTES"section below). For the arcs, the "streams" from the old layer are coded as hydrologic connections, and other features are included as well, like shorelines and apparent wetland limits. The scale description in the layer name - 1:12,000 - represents that of the original stereo color-infrared photography used in the interpretation. The features that were in the old layers were copied into the new layers and then processed to produce the above changes. MassGIS stores the two layers in an Oracle-based ArcSDE geodatabase format. They are named WETLANDSDEP_POLY and WETLANDSDEP_ARC. Additionally, an annotation layer featuring polygon labels is also maintained, named WETLANDSDEP_A_WET (black text). Please note that these layers provide a medium-scale representation of the wetland areas of the state and are for planning purposes only. Wetlands boundary determination for other purposes, such as the Wetlands Protection Act MA Act M.G.L. c. 131 or local bylaws must use the relevant procedures and criteria. The wetlands are interpreted from 1:12,000 scale, stereo color-infrared (CIR) photography by staff at UMASS Amherst. The photography was captured in 1990, 1991, 1992, 1993, 1999 and 2000. See the CIR Map for dates of the photography. The interpretation is field checked by Department of Environmental Protection (DEP) Wetlands Conservancy Program (WCP). Completed interpretations are then scanned and converted into rectified polygons and lines using standard photogrametric techniques by a consultant under contract to the WCP. Final quality control is performed by WCP GIS staff. The polygons and arcs are merged into a single layer (in coverage format) and additional attributes are added for the polygon features. The arc features are coded based on the adjacent polygon types, and attributes are added to the annotation subclass wet. An overlay process using the 1:25,000 Hydrography layer codes the PALIS_ID and PWSID attributes. The coding of the PALIS_ID and PWSID attributes was done using an overlay process and was not subject to the same quality control as the 1:25,000 Hydrography layer. Areas of wetlands in this layer may be shown as open water in the 1:25,000 Hydrography layer and so the coding of the PALIS_ID would not occur. Lines represented in the old 1:5,000 Streams layer are shown in this layer as hydrologic connections. These lines are only defined where they connect the various wetland types. These connections were not delineated within wetland areas, nor do they depict a complete stream network outside of wetland areas. Because the source scale of the CIR’s is 1:12,000, plotting of open water features at a larger scale when overlaid onto existing 1:5,000 imagery will reveal areas of open water that are not delineated as such. A small number of coastal polygons in this layer outside the interpretation area originated from USGS Digital Line Graphs or data from NOAA. They have WETCODEs of 88 and POLY_CODEs assigned by DEP GIS staff. The values for IT_VALC and IT_VALDESC are blank for these features. A closure line is defined as a boundary between similar polygon types that has no linear significance. Polygons with a POLY_CODE of 2 or 3 are considered the same so lines between them are coded as closure lines. The IT_VALC codes are incorporated as annotation label text in the ArcSDE layer WETLANDSDEP_A_WET. Note that these hydrography layers do not have feature names (e.g., "Quabbin Reservoir" or "Connecticut River") as attributes. To label the features in these layers, use the annotation in the HYDRO subclass of the Geographic Place Names layer. For questions please call the DEP Wetlands Conservancy Program at 617-292-5907. Individual tile completion dates are stored in the DATEWET item in the statewide Orthophoto Index layer. In the March 2006 update, the following coding changes were made: ARC_CODE 99 no longer exists, as all OQ index tile boundaries have been removed and all features edge-matched and dissolved based on attributes, and attribute discrepancies have been resolved. ARC_CODE 88 defines the edge of the layer except for ocean areas. Two POLY_CODEs were added as the open water areas have been further broken down with areas of tidal influence or salt ponds given a POLY_CODE of 9 and areas considered open ocean given a POLY_CODE of 10; the wetcode remains the same (9). Additionally, features outside of the delineated areas have been removed, though no clipping or extending to the state boundary has been done. The coding for reservoirs was checked against the USGS 1:25,000 Hydrography coding and is accurate. The coding for Palis_ID was checked also, but is still not considered to be complete. Two areas of missing data on the east and west sides of the Quabbin Reservoir project area have been completed. With the December 2006 update the layer is complete statewide; this update filled in pieces of tiles 197918 and 197922, which cover parts of the towns of Ayer, Groton, Harvard, and Littleton. In January 2007 some missing arcs and a missing polygon comprising open water in the Housatonic Watershed were added. In April 2007 edits were mode to coastal areas (both polygon and arc layers). 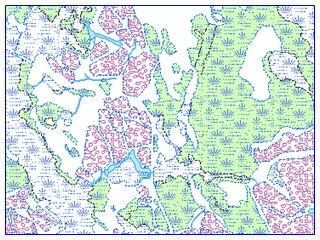 All watershed-based shapefiles along the coast and the statewide shapefiles were replaced on the MassGIS ftp site at this time. In January 2009 some extra features were added and the AREAACRES and AREASQMI values were recalculated. For other hydrographic features, also see the Hydrography (1:25,000), Hydrography (1:100,000) and Major Ponds and Major Streams layers. Also see the Title 5 Setback Areas and Wetlands Change layers.